FISHTECH INC. is involved in all of the facets of the world abalone market. We match our clients' fisheries or farm production with the most appropriate DWE (Distributor, Wholesaler & Substantial End User). Abalone DWE's differ greatly from country to country and likewise, the marketing of abalone must take into consideration the diverse nature of abalone preparations and presentations worldwide. A higher abalone price is not secured through some mysterious knowledge of the market, but rather through FISHTECH INC. personnel working with your company to match your capabilities and needs with specific worldwide DWE's. Once the appropriate abalone quality and form is established, FISHTECH matches your abalone with a specific region and then the country, city and individual DWE. 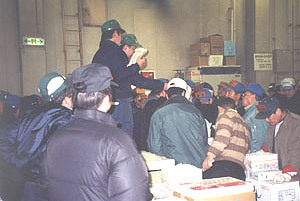 FISHTECH INC. has been developing worldwide abalone markets for over 14 years. We understand that the abalone form, preparation and culinary occasion is quite unique in all the world of seafood. DWE's will not beat a path to your door (at least not at the most favorable price) for just having a good farmed abalone. The bottom marketing line is that FISHTECH INC. services are designed to get your product and procedures in place so that your company may achieve more favorable pricing. We work with fisheries and farms with abalone production ranging from 25mt to 2000mt+ annually. FISHTECH INC. is NOT interested in sales based on the short term or upon specific availability of abalone at a given moment. FISHTECH INC. IS interested in long range marketing, wherein we work with your farm to develop a program to match your farmed abalone with specific worldwide DWE's. Presenting individual DWE's that would result in favorable pricing for your abalone. Assisting your company with the marketing of all varieties of abalone product--live, frozen, canned, dried and further processed. FISHTECH INC. can work with you to create appropriate packaging methods for all varieties of abalone product. When appropriate, FISHTECH INC. can assist your farm in the process of developing a brand name product. 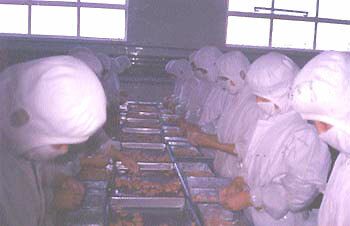 FISHTECH INC. production assistance may include sorting and grading for market as well as size and quality standards. FISHTECH INC. can also assist you in developing farm programs designed to maximize quality and price. Assist your company with appropriate Health Certificates or other purchaser requirements. In its long history, abalone has inspired wonderful gastronomy, passion and crime. The demand for this unique shellfish has remained quite consistent, however, the worldwide abalone supply has been seriously depleted. Over-harvesting, criminal poaching activities and a degradation of quality of the oceans of the world have taken a consistent toll on the commercial availability of abalone. Hence the creation of the relatively new industry of abalone farming.